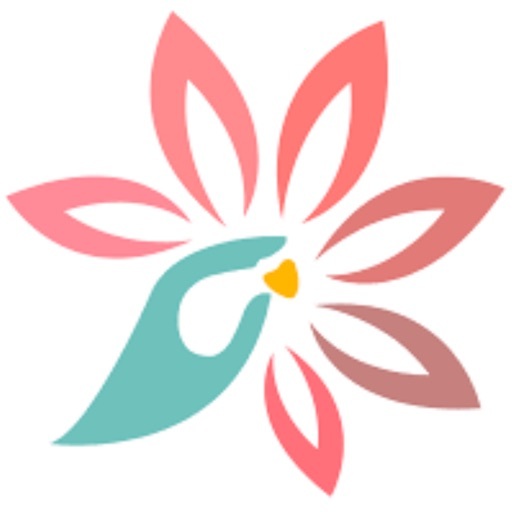 Skincare Pro is a comprehensive app for estheticians, skin care professionals, laser technicians, massage therapists and other personal service providers. 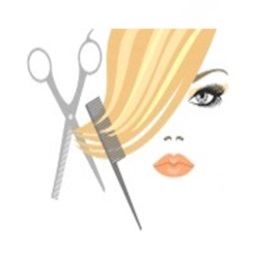 A client focused schedule of your appointments is the centerpiece. Scheduler provides daily, weekly and monthly view of your appointments. Integrated with your client contact info you can quickly send reminders, check out clients and track your all financial results. 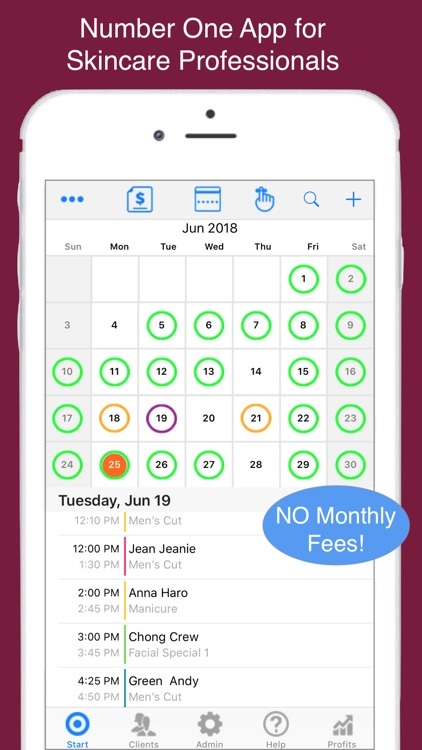 There are NO monthly or annual fees to use your app. Our app offers the most functionality for the price. Since the app uses your existing Contacts and Calendar you are up a running in no time! How to movies and guides show you how to use your new app. 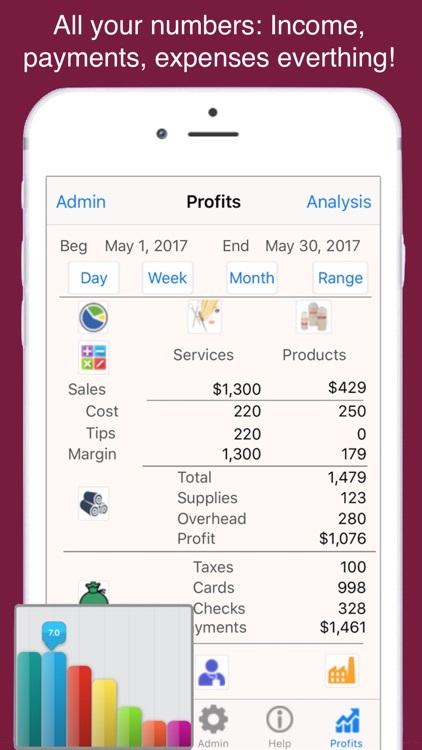 This comprehensive business app provides complete financial information including inventory control and Profit & Loss Info. All information is maintained on your device and there is no need for connectivity or outside servers as is common with many of the more sophisticated business apps. 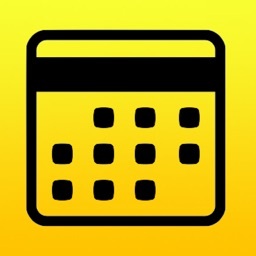 Scheduler - Your calendar on steroids. 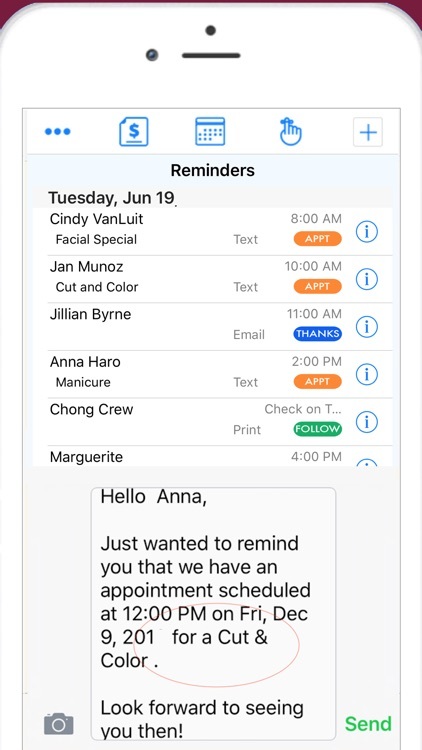 Select client names from your contacts and add the service information to the appointment. 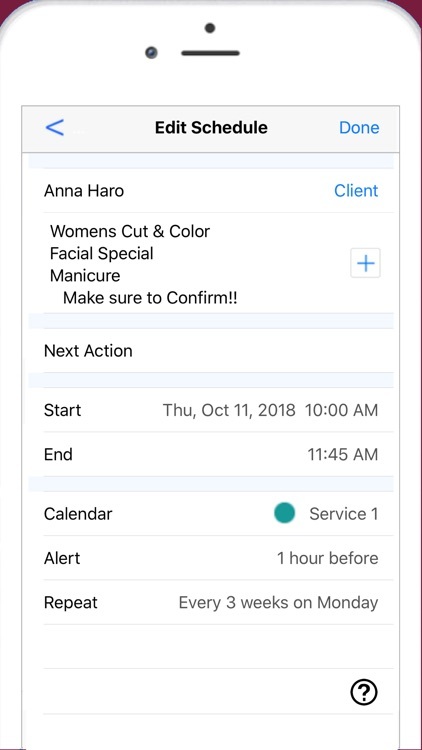 Create reminders, complete and invoice the transaction, view contact management info and send appointment confirmations. All right from the scheduled appointment. 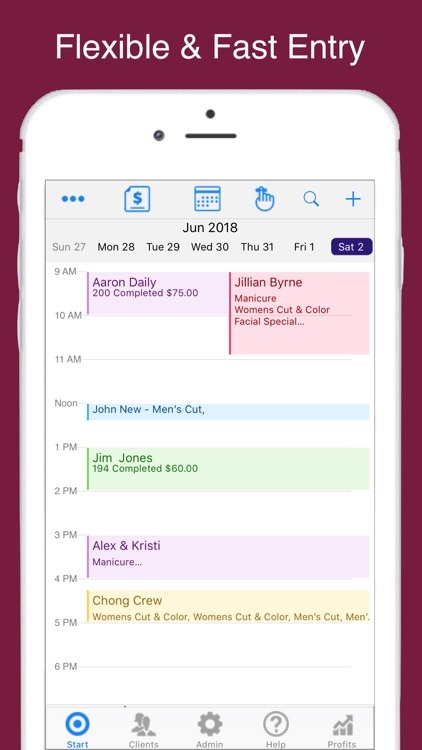 View multiple calendars, set alerts, repeating appointments and search history. Repeating Appointments - Full support for Weekly, Monthly & Daily repeating appointments. can specify ending date or never. Completing appointments does not alter future appointment. 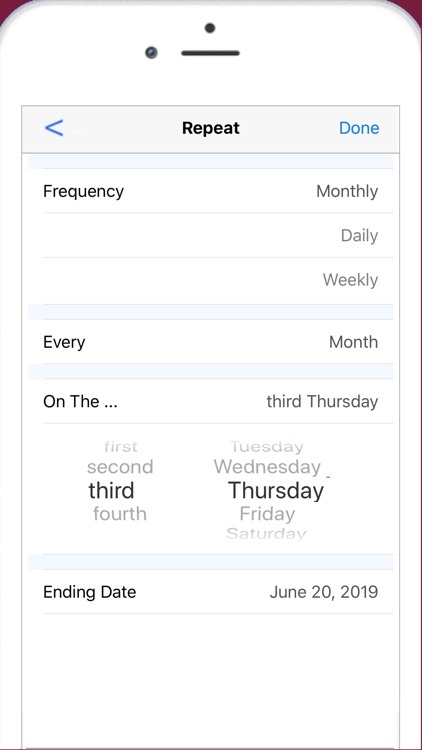 Entry is simplified compared to the devices Calendar app. 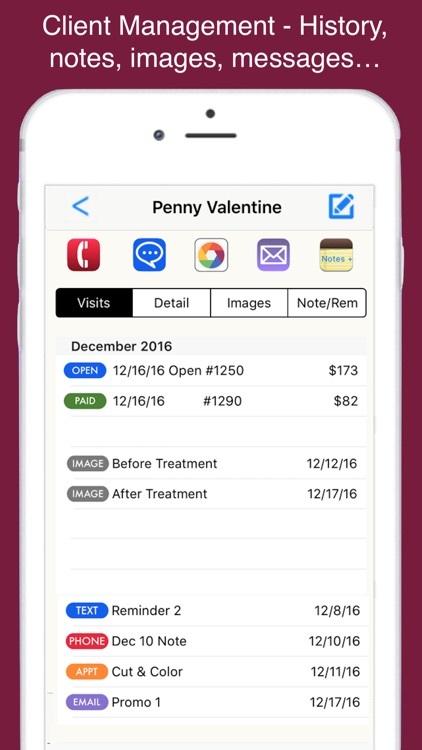 Contact Management - Store notes, images and track other communications with your clients and have the in app ability to call, text, email or map without leaving your app. Client History - Maintain all service and sales history for each client including notes, images and more. Services, Products & Supplies are maintained in the app with detailed multi-line descriptions, costs, price, units & on hand quantities. These can be added on-the-fly or maintained from your stored items. 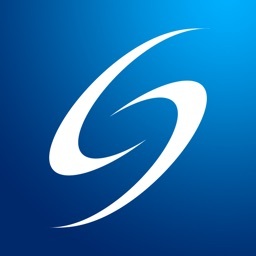 Images from both the Camera and Album apps may be used for logo's and saved with your client information. 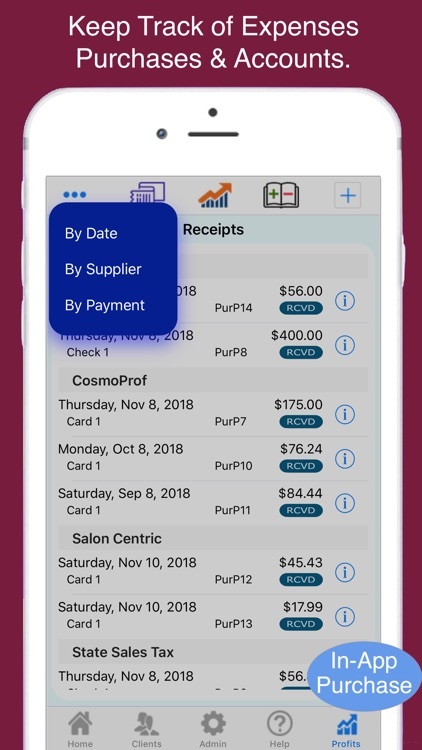 Financial Information - Is instantly available for sales, payments, taxes and inventory for any timeframe with just a few taps. Information may be viewed on screen or downloaded for further analysis with any spreadsheet. Help and Support - Context sensitive help shows by topic as well as how to movies. Email, text and phone support provides to help with any questions or issues. 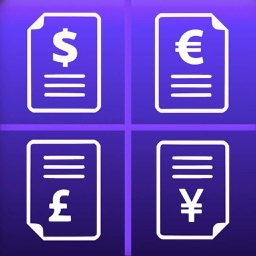 International Currency Dates & Dynamic Type (the ability of the app to change font sizes) are all included in the app. Automatically synchronize your information utilizing iCloud technology. For up to five devices this In App will keep your business info inSync and available on all your devices! 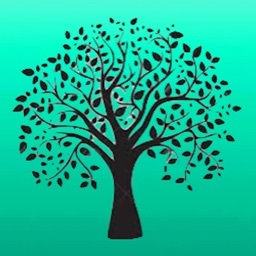 Profits provides a complete financial system that tracks all sales, purchases and expenses. Includes ALL formatted PDF Reports that can be directly printed or attached to emails. Document Design & Delivery- Change document field names of sales receipts, change formats easily with unique design for invoices and estimates. Use your local language and terms. Batch deliver Printed & Email docs. Download your financial info and backup your info in a Spreadsheet format. Backup all of your key data bases to a spreadsheet.